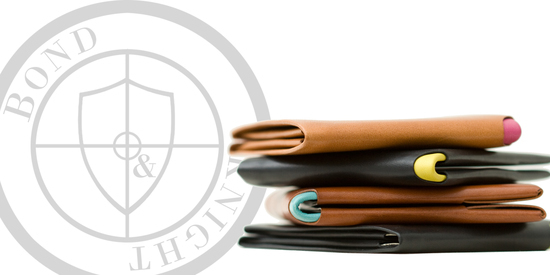 Bond & Knight are independent British leather designers specialising in handmade, bespoke wallets. Our wallets are made using a vintage 1940s inspired design, and use one single piece of folded leather, with no stitching and no seams. That Means they are super strong, super slim and ultra cool. For our unique centre pieces we've teamed up with an exciting collection of well known and up-and-coming artists to offer vintage styled pin-up designs and colour printed wallets that you won’t find on the high street. Every hide that we use is hand picked and we source only the highest grade, naturally tanned Italian leather, distinguishable by the beautiful natural grain. This combination of design, artwork and our uncompromising commitment to quality means our wallets are unique, super soft, ultra-slim, and yet super strong. Each wallet is handmade and despatched within 5 days from orderingvia Royal Mail signed for or international AirSure.